This is mostly an encore presentation of a previous post. A while back, a fellow blogger posed the questions: what is a baby tool/thing/gadget that you have really enjoyed. There are a lot of things that I have been glad that I had and many that I wonder, why did I waste my money. I suppose if I had to choose one item that we have gotten incredible use out of and lots of comments when we use it, it would be Kiddopotamus Tiny Diner. A really simple thing when you think about it. A reusable table mat. It rolls up neatly into itself, so it fits in the diaper bag and after use, keeps the mess inside. 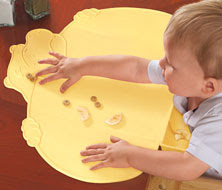 It has a wide and deep surface and has a tray to catch all those dropped food items. No more worrying about how clean the table is when you are dining out and the catch tray helps reduce the amount of food lost to the floor or left covering your toddler's lap. We love it so much, that I have bought them for almost everyone I know that has had a baby since my son was a toddler. We have used it for the past 4 1/2 years, through two children and it is still holding up fine. Definitely worth the $10 or $12 it cost all those years ago. It amazes me when we head out to dinner how many other diners comment on the mat and how clever it is. Recently, they seem to be more widely available and I am seeing even more diners using them for their young children. Twist crayons (they don't break as easy as the other crayons). Crayola TaDoodles (the crayons don't stay in the holder). Check out Works For Me Wednesday over at We are THAT Family, for more tips, tricks and products that work for others. I'll have to try that place mat! I love my ERGO carrier, and the swaddle me was a great product for my little guy!